Please note, there is a newer version of DatePad available. Please go to the datepad page of this website to find the latest version of DatePad. DatePad combines the power of a calendar with the ease of a text editor. DatePad can be used in a large number of ways. It’s main function is to store text which is specific to a certain date. You can also store text specific for certain times. It is the perfect way to keep track of whatever you are interested in of your own history. Use DatePad to keep a diary, use it to manage a project, write down your thoughts, keep a record of your dreams.. and for sure there are a lot more possibilities. You can download DatePad 2.2 for free. The download is a compressed file you will need to uncompress first and then run the setup program to install DatePad. The help file is divided into a few sections to make it easier to navigate to the help section your need. DatePad is freeware. DatePad comes with absolutely no warranty. Use at your own risk. If you encounter any problems with this software please inform me about them, and I’ll try to come up with a solution. DatePad may also work on other versions of the Windows operating system but this is not guaranteed. During the installation of DatePad some addition software is also installed. These include MSXML, used for the internal storage of DatePad documents, a calendar control and a rich text control. The effects of these parts of the program on your computer should be zero, but this is not guaranteed. The author only allows distribution of DatePad on any media after permission. Send an email to adrie@ajebe.com to ask for permission. Include in the email the distribution type (Magazine, Shareware CD, etc.) and a description of the references made to DatePad (article, product comparison, etc.). ‘Cut’, ‘Copy’, ‘Paste’, ‘Delete Selection’ and ‘Select All’ menu items have been added. This functionality was already available, but now also accessable through the menu. Interface language can be changed through the file menu. You can choose from English, Dutch and Spanish. You can make your own language version of DatePad. If you are interested in doing this contact me via email. Date and time calculation added. You can now calculate new date and time entries based on a selected entry or based on the system date and time, making it possible to add or substract months, days, hours or minutes. The main screen is divided into three parts. By default there is a treeview on the left side of the screen and an area to enter text on the larger right part of the screen. Texts you type are related to the date selected in the treeview. This date is also displayed in the status bar. Using the F1 and F2 keys it is easy to navigate to earlier (F1) or later (F2) dates. Remove formatting Removes all formatting like color, font types, alignment, style and reverts all text to the default formatting as specified in the editing settings. System Day display the system day name, like Monday, Tuesday, Wednesday, etc. System Date displays the entire system date like 29 July 1975, 1 April 2007, etc. and System Time displays the current time like 12:00, 21:15, 08:15, etc. Entry Day, Entry Day and Entry Time add similar text to the editing screen, but based on the entry time and not based on your system time. The shortcut key to quickly type the current date is Ctrl-J. The shortcut key to quickly type the current time is Ctrl-K.
Insert Text From File... Imports a text file into your DatePad document. Font... Change the font of your selection. Size Change the font size of your selection. Align Change the alignment of the currently selected line. Style Change the style of your selection. Color... Change the color of your selection. The treeview is used to show a schematic view of your document. It shows years, months, days and times, and provides a simple way to navigate to the various parts of your document. Simply click in the treeview on an entry to navigate to the text belonging to this entry. Previous Navigate to the previous entry in the currently active DatePad document. The shortcut key for this option is F1. Next Navigate to the next entry in the currently active DatePad document. The shortcut key for this option is F2. Calendar... Show the calendar. Select a date in the calendar to add an entry for this date in your currently active DatePad document. The shortcut key for this option is Ctrl-D. To cancel the calendar screen press Esc. Clock... Show the clock. Select a time to add an entry for this time in the currently active DatePad document. The shortcut key for this option is Ctrl-T. To cancel the clock screen press Esc. 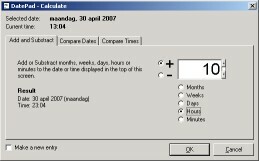 Date/Time Calculator... Shows a simple date calculator. This is an easy way to calculate a new day or time based on the selected or current date or time. You can add or substract months, weeks, days, hours and minutes. The result will be a new entry in your DatePad document. The shortcut key for this option is Ctrl-L. To cancel the calculator screen press Esc. Delete Selected Entry... Deletes the currently selected item in the treeview including all items nested inside the selected item. Be careful with this option because it cannot be undone. Deleting a year entry will also delete all months, days and times inside. The shortcut key for this option is Delete. Delete Empty Entries... This option scans your entire document and deletes all entries that do not have and sub-entries and which do not have any text. No text will be deleted, only entries in the document like times without text or dates without underlying times and without text. New Starts a new document. The default entry will be an entry for the current day. If the displayed date is incorrect check the date you computer is set to. The shortcut key for this option is Ctrl-N.
Open... Opens an existing DatePad document. The shortcut key for this option is Ctrl-O. Reopen Shows a list of recently opened DatePad documents to easily reopen these documents. Close Closed the current active DatePad document. A warning will appear when a document is closed which contains unsaved changes. The shortcut key for this option is Ctrl-Q. Save Saves the current active DatePad document. Files are by default saved in the DatePad format (*.dp2). The shortcut key for this option is Ctrl-S.
Save As... Saves the current active DatePad document using a different name, or using a different file format. Documents can be saved as text, rich text, html or xml. Rich text is a file format that can be read by many other programs, and it is the perfect file format if you wish to enhance your document for printing or if you wish to stop using DatePad. Save Page As... Saves only the current page of the current active DatePad document. Set As Default Sets the current active DatePad document to be the default. This means this document will be opened automatically in the future when DatePad is started. Print... Prints the current active document. Print Page Prints the current page of the current active document. The shortcut key for this option is Ctrl-P.
Reset to Default Stops using any language file, and will return the interface language to the default english. Any language file can be modified and new languages can be defined. To do this use a text editor to create new ini files, or edit the existing ini files in the DatePad installation directory. Settings... Shows the settings screen. Exit Exits DatePad. The shortcut key for this option is Alt-F4. Undo Changes Undo your last change. Undo All Changes Undo all changes made since your last save. Cut Cut the current selected text. Copy Copy the current selected text. Paste Paste whatever is on the clipboard to the DatePad editing screen. Select All Selects all the text in the DatePad editing screen. Delete Selection Deletes the text which is selected in the DatePad editing screen. Delete Selected Entry... Delete the entry that is selected in the treeview, including ALL entries on a deeper level. Be careful with this option! If you delete a month entry, all underlying day entries will also be deleted. Delete Empty Entries... Scans the entire current active document and removes all entries that contain no text. Insert New Entry Inserts a new part in your DatePad document. This can be the current day, the current time, or any selected date or time. Use F11 to directly insert a new entry for the current day, or if this entry already exists F11 will navigate to this entry. Use F12 to directly insert a new entry for the current time, or if this entry already exists F12 will navigate to this entry. Insert Text Insert a piece of text at the place of the cursor stating the computer date, time or entry date or time. Insert Text From File... Import a text file, and place the text at the place of the cursor. Remove Formatting Removes all formatting from the current selected entry in the current selected document. Only the current page is modified. Find... Find any literal text in the currently active DatePad document. The shortcut key for this option is Ctrl-F.
Find Next Find the next occurance of a previously found term. If there was no previously entered term this option will show the normal search screen. The shortcut key for this option is F3. Calendar... Show the calendar. Select a date in the calendar to add an entry for this date in your currently active DatePad document. The calendar screen can be left open while you are working with your DatePad document. Single click on a date in the calendar to create a new DatePad entry, or to navigate to an existing entry. Double click for the same functionality, but afterwards the calendar screen will be automatically closed. The shortcut key for this option is Ctrl-D. To close the calendar screen press Esc. Date/Time Calculator... Shows a simple date and time calculator. This is an easy way to calculate a new day or time based on the selected or current date or time. You can add or substract months, weeks, days, hours and minutes. The result will be a new entry in your DatePad document. The shortcut key for this option is Ctrl-L. To cancel the calculator screen press Esc. Show Toolbar Defines if you want to see the tool bar or not. This setting is automatically saved when you close DatePad. Show Statusbar Defines if you want to see the status bar or not. This setting is automatically saved when you close DatePad. Show Treeview Defines if you want to see the tree view or not. This setting is automatically saved when you close DatePad. The shortcut key for this option is F4. Show Docked Calendar Defines if you want to see the docked calendar or not. This setting is automatically saved when you close DatePad. The shortcut key for this option is F5. Tile Horizontally Organize the opened DatePad documents horizontally. Tile Vertically Organize the opened DatePad documents vertically. Cascade Organize the opened DatePad documents cascaded. Arrange Icons Organise the opened DatePad documents which are minimized within DatePad. -list of active documents- Change the currently active document to one selected in this list of active documents. There can be up to 5 documents listed here. If available the shortcut keys for this option are Shift-F1, Shift-F2, Shift-F3, Shift-F4 and Shift-F5. To scroll through all the open documents, including the ones that have not been saved you can use Ctrl-F6. Contents... Displays this help document. More help can be found online at ajebe.com. About DatePad... Shows DatePad version information. Navigate to the previous entry in the currently active DatePad document. Navigate to the next entry in the currently active DatePad document. Starts a new document. The default entry will be an entry for the current day. If the displayed date is incorrect check the date you computer is set to. Opens an existing DatePad document. Saves the current active DatePad document. Prints the current page of your document. Show the calendar. Select a date in the calendar to add an entry for this date in your currently active DatePad document. Show the clock. Select a time to add an entry for this time in the currently active DatePad document. Shows the calculator. Calculate a new date or time to add an entry for the resulting time or date in the currently active DatePad document. Find any literal text in the currently active DatePad document. The status bar shows the date of the entry you are currently working in. Double clicking the displayed date will show the calendar window. The settings are used to configure DatePad. Default Document The document displayed here is your default document. It will be opened automatically each time you start DatePad. The default document is not opened when you start DatePad by double clicking a DatePad file. In this case only the requested file is opened. 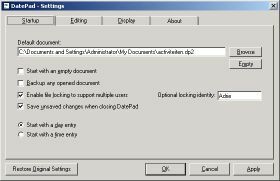 Start with an empty document If you do not supply a default document DatePad can open a new document each time you start the program. This option if only used if no default document is specified. Backup any opened document Makes a backup copy of the files that are opened. Enable file locking Makes a file lock for all the files that are opened. This file lock is removed when the file is closed. If another user tries to open a locked file a warning will be displayed. Optional locking identity If file locking is used a identity can be specified. This identity will be used in the warning message to indicate which used is editing a DatePad file. To correctly use this option different instances of DatePad should have different identities. Save unsaved changed when closing Automatically saves a DatePad file when is contains changes at the time it is being closed. Start with a day entry When a DatePad document is opened DatePad will automatically add an entry for the current year, month and day. Start with a time entry When a DatePad document is opened DatePad will automatically add an entry for the current year, month, day and time. <systemday> display the day name, like Monday, Tuesday, Wednesday, etc. <systemdate> displays the entire date like 29 July 1975, 1 April 2007, etc. and <systemtime> displays the time like 12:00, 21:15, 08:15, etc. System variables represent the date or time of your computer. This will record automatically the actual date you make a new entry. If you want to record the date of the entry itself you can use the variables <entryday> and <entrydate>. Default font This is the font that will be used if you use the ‘Remove Formatting’ option in the main editing screen. All formatting will be removed and will be reset to the font indicated here. Colors used in the treeview This option is used to enhance the treeview display. Bij clicking the buttons in front of the text a color can be selected. This color will be used for all entries of the selected type in the treeview display. This option can for example be used to display weekends in a different color, by selecting different colors for Saturday and Sunday. Calculate is a function that is based on the current active entry in your DatePad document. Using the calculate option you can add or substract months, days, hours or minutes. You can calculate the difference with other days, and you can calculate the difference with other times. After calculating you can close the screen with the ‘OK’ button or the ‘Cancel’ button. The screen can also be closed by pressing the Esc key. If the checkbox in the left bottom of the screen (‘Make a new entry’) is checked pressing the ‘OK’ button will result in a new page in your DatePad document. In this screen you can select if you want to add or substract by selecting the ‘+‘ or ‘–‘ sign. After you can select an amount and then select the type this amount signifies. It is possible to add or substract months, weeks, days, hours or minutes. Compare dates compares the selected date as displayed in the top of the screen to any other date you select in the calendar. The screen will show you the difference in days, months and years if applicable. You could use this function to for example calculate the amount of days untill your birthday by selecting your next birthday in the calendar in the right of the screen. Compare times compares the selected time as displayed in the top of the screen to and other time you select in the clock. The screen will show you the difference in hours and minutes. It is also possible to compare to a time from yesterday or tomorrow. You did not find the information you needed? There are more ways to find out that you need to know. Cannot install DatePad without error(s). When installing DatePad on some systems the installer will not be able to install some parts of the software. Usually this is due to the fact that newer versions are already available on the system where DatePad is being installed. You can ignore the warning and test the installation. Usually DatePad will work. DatePad does not work anymore after installing some other program. Sometimes the DatePad installation is corrupted. This can happen when other programs are installed which change some of the files used by DatePad. This can usually be repaired by reinstalling DatePad. DatePad does not start normally anymore. Sometimes the registry entries of DatePad are corrupted. This can be resolved by double clicking the file ‘DatePad registry reset.reg‘ in the DatePad installation directory. Normally DatePad will be installed in C:\Program Files\DatePad\. There is more information about DatePad online at ajebe.com and also at leiden365.nl. This is also the place to find updates, fixes and other things related to DatePad. Please feel free to email questions, comments, remarks or whatever to the author of DatePad. My name is Adrie Berg and my email is adrie@ajebe.com. I will be happy to receive your reactions.